The 2018 Premier Collectors’ Edition is now available. 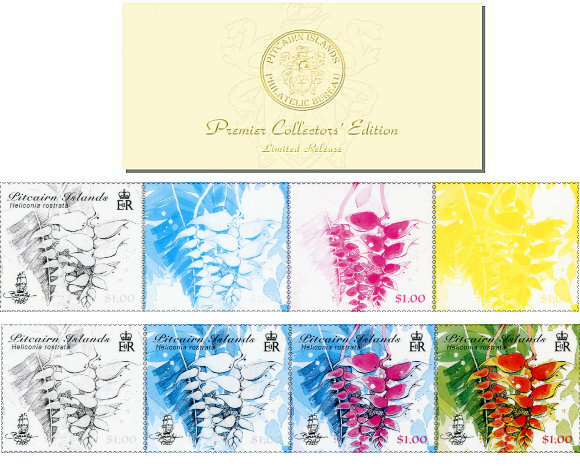 "Colours of Paradise" is the subject for 2018 and the stamps shown are developed through the colour separations and progressives process. The Collectors Editions are strictly limited to 200 packs and this bound-to-be-sought-after edition will be available until sold out. To ensure you obtain this edition in the series, please order here. Pitcairn Island's first postage stamps were issued on 15 October 1940, and issues have been sought after by philatelists, or those seeking a connection with the Pitcairn Islands and its fascinating history involving the HMAV Bounty. The Pitcairn Islands Philatelic Bureau represents the Pitcairn Island Post Office and is maintained in New Zealand in an effort to overcome communication and supply difficulties resulting from Pitcairn's isolation. The Bureau limits the number of special issues to no more than six a year which means generally, that a collection of every mint stamp produced during the year will cost the collector approximately $NZ40.00, exclusive of the current definitive issue. Cancelled to Order stamps, corner blocks, gutter pairs, miniature sheets, and First Day Covers are also available. Join the Stamps Bureau As a preferential Standing Order customer you will receive new stamp issues and/or annual collections as soon as they are released. You will also be sent bulletins giving issue information and details of the following issue plus special offers from time-to-time that are only available to Standing Order customers. Stamp issues currently available from the Philatelic Bureau. These feature all of the Pitcairn issues released in that year. They can be ordered with or without Pitcairn's latest definitive issue. Past Issues Issues back to 2000 are available from the Philatelic Bureau Archive but at a 50% premium on face value. For issues prior to 2000 please try worldwide philatelic agents and dealers.